Danderyd folk dance group derives its name from the municipality to which we belong, Danderyd municipality that is located about 10 km north of Stockholm. We are a Swedish folk dance group that have celebrate our 60th anniversary 2010. We love to dance folk dance and have fun. We are 51 active and 18 passive members. We meet once a week, when we practice, laugh and dance. Our ages are from 23 years to more than 80. During the year we have various dance shows. When Christmas comes we enjoy playing and dancing around the Christmas tree with children in different ages. Midsummer is the largest event for us dancers here in Sweden. We have dance shows every day for a week that ends at Midsummer eve with 3 big shows. 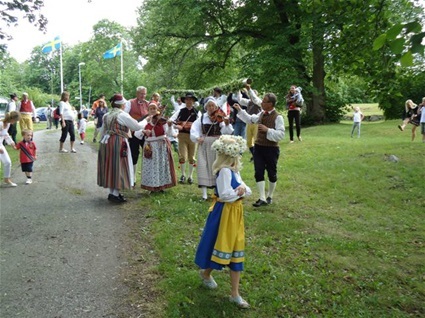 It's a typical Swedish tradition where we dance and sing around a maypole, which is covered with leaves and flowers, along with children and adults and with hundreds of spectators who greets the summer. We also participate in various enterprises´arrangements where we can showcase our Swedish folk dances and folk costumes. The folk costumes come from different provinces and some participants also have costumes from abroad. We have "live" music when we dance on Tuesday evenings. Our musicians play fiddles, accordian, clarinet, guitar and keyed fiddle. We like to travel in Sweden and experience the Swedish countryside and sometimes we take a trip abroad.